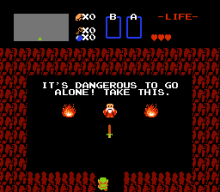 GameSpot: It’s Dangerous to go Alone! Nintendo has started a lot of memes, most of them unintentional. Each iteration in the Zelda franchise in particular seems to create popular new phrase, image, or otherwise famous “thing”. Nintendo also makes a large amount of references to their own games, but it’s the memes that leak out to non-Nintendo culture that are truly dangerous. 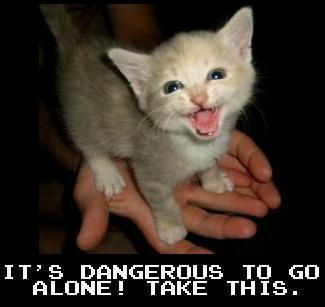 Perhaps the most famous of all Zelda memes is “It’s dangerous to go alone! Take this!” which originated from an early screen in the very first Legend of Zelda. Hit the jump for a quick look at how this meme evolved to become so famous! Yes, this phrase’s fame was all started by the image you see to your right. Everything you heard about the Internet was true, it really is dominated by cats. Internet jokes aside, it’s pretty incredible the amount of places this phrase appears in non-Zelda situations. I don’t think the GameSpot video even does it justice, as I’m sure some version of “It’s dangerous to go alone!” has made appearances in more inconspicuous places. 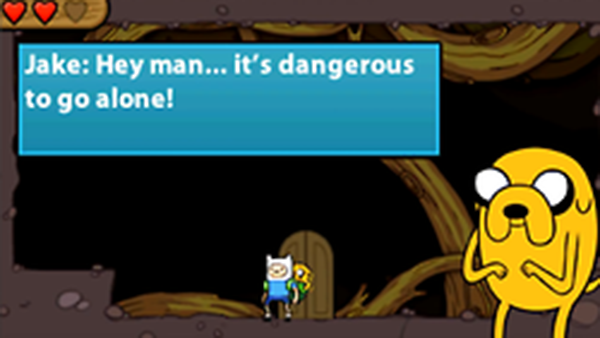 For example, in a new Nintendo DS release, the game Adventure Time makes a quick reference, practically nonchalantly. This meme is so famous it’s starting to be stated casually. What are your thoughts on this meme? What’s your favorite occurrence of the phrase, or any other Zelda memes? Tell us in the comments!